1. School of Chemical Engineering and Technology, Harbin Institute of Technology, 150001 Harbin, People's Republic of China. 2. Institute for Lasers, Photonics and Biophotonics, Department of Chemistry, University at Buffalo, The State University of New York, Buffalo, New York, 14260, USA. Optical sensing plays an important role in theranostics due to its capability to detect hint biochemical entities or molecular targets as well as to precisely monitor specific fundamental psychological processes. Rare-earth (RE) doped upconversion nanoparticles (UCNPs) are promising for these endeavors due to their unique frequency converting capability; they emit efficient and sharp visible or ultraviolet (UV) luminescence via use of ladder-like energy levels of RE ions when excited at near infrared (NIR) light that are silent to tissues. These features allow not only a high penetration depth in biological tissues but also a high detection sensitivity. Indeed, the energy transfer between UCNPs and biomolecular or chemical indicators provide opportunities for high-sensitive bio- and chemical-sensing. A temperature-sensitive change of the intensity ratio between two close UC bands promises them for use in temperature mapping of a single living cell. In this work, we review recent investigations on using UCNPs for the detection of biomolecules (avidin, ATP, etc. ), ions (cyanide, mecury, etc. ), small gas molecules (oxygen, carbon dioxide, ammonia, etc. ), as well as for in vitro temperature sensing. We also briefly summarize chemical methods in synthesizing UCNPs of high efficiency that are important for the detection limit. Keywords: Upconversion, Nanoparticles, Biosensing, Chemical Sensing, Temperature Sensing. Rare earth (RE)-doped upconversion nanophosphors (UCNPs) can efficiently convert near-infrared (NIR) light into visible or ultraviolet (UV) luminescence using a stepwise multiphoton process in a system of real energy levels of RE ions which are embedded in an appropriate host lattice [1-4]. Along with the low cytotoxicity provided by the inorganic host lattice, this unique frequency converting capability imparts a number of advantages to UCNPs such as absence of autofluorescence, deep light penetration in tissues, and minimum photodamage to living organisms [5,6]. These merits make them attractive in bioanalytical and biophysical studies. However, the low luminescent efficiency and the large size of UCNPs are two main limiting factors for their biological applications. Smaller UCNPs with high luminescent efficiency has been being investigated in order to improve their performance in sensing applications as well as in other biophotonic and nanophotonic applications [7-11]. It has been shown that RE fluorides, in particular, REF3 and AREF4 (RE=rare earth; A = Li, Na, K) material, generally possess higher UC efficiency than the other UC host materials investigated (oxide, oxyfluoride, vanadates, oxysulfide, etc), due to their low phonon energies (< 400 cm-1) which minimized multiphonon-assissted nonradative losses in the intermediate state and the emitting state of RE ions [12-14]. Hence, a range of chemical approaches have been being explored to fabricate high-quality small-sized RE-doped fluorides nanocrystals (monodisperse, high uniform, well-shaped, phase-pure, and highly efficient) [15-19]. Among all synthetic techniques, thermal decomposition and hydro(solvo)thermal reaction are found to be two general strategies in producing fluoride nanophosphors [20-23]. Although the focus of this review is on the use of UCNPs in sensing applications, it will be helpful to briefly mention some recent results regarding high-quality and efficient UCNPs. It is well known that bimolecular sensing is of great importance in biological detection and molecular medicine, while the real-time monitoring of the change of fundamental parameters, e.g., the pH value and the temperature in living cells, is important for understanding the programmed activities in cell. Molecular oxygen and carbon dioxide are involved in numerous biological and biochemical processes, and the harmful ammonia is released as a result of enzymatic activity [24-28]. The measurement of concentration of these gas molecules in biological fluid, therefore, is of particular importance for clinical medical diagnosis . In addition, some hazardous ions, e.g., cyanide ions (CN-) and mercuric ions (Hg2+) are extremely toxic to mammals; selective detection and quantification of these poisonous ions in water, food or biological environment is necessary [29-31]. Although optical sensing techniques based on stokes-shifted downconversion fluorophors (e.g., dyes, quantum dots) are engaged in these sensing applications, it is important to develop new sensing techniques that have higher sensitivity and more flexibility . UCNPs utilize real intermediate energy states of RE ions and step-wise multi-photon processes to emit visible or UV luminescence when excited at low-energy NIR light of 1-103 W/cm2, typically at ~980 nm . The efficiency of UC process is generally by orders of magnitude higher than the multiphoton absorption induced fluorescence where the virtual intermediate states and an excitation density of 106 W/cm2 provided by a femtosecond laser are utilized [33,34]. As the NIR excitation wavelength of 980 nm is transparent to tissues or biomolecules, non-invasive sensing detection in deep tissues is permitted [35-37]. Moreover, the emission wavelength of UCNPs has a large anti-Stokes shift when compared with the excitation line. The fluorescence of indicators induced by energy transfers from UCNPs can generally be isolated from the scattering excitation light and Stokes-shifted autofluorescence in tissues or biomolecules . This unique feature results in a high signal to background ratio, allowing hint detections of interested entities. Here, we summarize recent works on the use of UCNPs in different sensing applications. It encompasses two sections of (i) synthesis of UCNPs, and (ii) sensing applications. Figure 1 illustrates the scheme of the sensing section that includes bio-molecular sensing (e.g., avidin, ATP, etc), ions sensing (cyanide, mecury, etc), gas molecules sensing (oxygen, carbon dioxide, ammonia, etc), as well as temperature sensing in live cells. An illustration of structured sensing topics in this work. Adapted from references [81, 89, 95, 113]. In the past decade, many efforts have been dedicated to prepare the RE-doped fluoride UCNPs with high quality in order to meet the requirement of various bio-related applications, in particular, smaller UCNPs with size compatible to biomolecules or protein. Up to date, the established preparation methods encompass thermal decomposition, hydro(solvo)thermal, ionic liquids-based synthesis, co-precipitation, combustion, and sol-gel. Among them, the thermal decomposition method and the hydro(solvo) thermal method are two general and important approaches for controlled synthesis of uniform fluoride NPs. Up to now, most of sensing applications are based on nanoparticles prepared using these two approaches. Hence, we will discuss their synthetic chemistry first in this section, and then discuss the use of them for sensing applications in section 3. In a typical thermal decomposition procedure, organic precursors (lanthanide or alkali trifluoroacetate) are decomposed in a high-boiling organic solvent with the assistance of one or more surfactants, yielding corresponding metal fluorides at an elevated temperature [39-41]. A precise control over the nanocrystal phase, size and morphologies can be achieved by varying reaction parameters such as, the composition and amount of precursors, the amount of surfactants (e.g., OA and/or OM), solvent (e.g., ODE) as well as reaction temperature and time. In addition, the loading ways of precursors are also important of the final product, which encompass two types: (i) the “heating-up method”; (ii) the “hot-injection method” . In the “heating-up” process, the temperature of reaction solution is elevated from room temperature to a specific high temperature to produce NPs, while the “hot-injection” process employ the way of the injection of pertinent precursors into a hot solution containing the high-boiling solvent and surfactants. Despite that the fundamental reaction chemistry are identical for these two different types of loading ways, the nucleation rate and the phase transition processes are quite different in these two methods. Based on the principle described above, Yan et al. 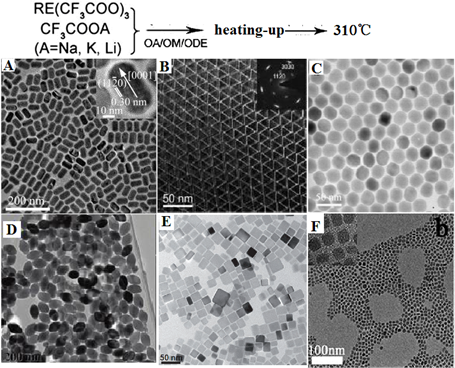 first reported the preparation of high-quality NaYF4 nanocrystals and monodispersed LaF3 triangular nanoplates (Figure 2A and B) through a heating-up process via decomposition of appropriate metal trifluoacetate in the presence of oleic acid (OA)/1-octadecene (ODE) . Subsequently, a wide range of high quality RE-doped fluoride NPs of various types are produced, which exhibit highly efficient UC emissions. Examples are as follows. (i) Zhang group reported the synthesis of monodispersed Yb,Er or Yb,Tm co-doped hexagonal NaYF4 nanocrystals with narrow size distribution by consuming a stoichiometric amount of lanthanide chlorate precursors at room temperature . The uniformity of these nanoparticles is realized through the strong interaction between small cubic NaYF4 crystal nucleis or particles. (ii) Chen et al. prepared 80 nm sized monodispersed LiYF4 NPs by decomposing lanthanide and adequate lithium trifluoroacetates at 330 ℃ in 30 mL oleic acid and 30 mL 1-octadecene solution . The as-synthesized LiYF4 NPs displays high quantum yield ~1.2%, which is almost 4 times higher than the highest UC luminescence quantum yield reported to date. A large amount of lithium precursors provide an efficient nucleation and grow rates, leading to form uniform products, while the tetragonal crystal of LiYF4 provide a unique crystal field for a high UC efficiency. (iii) Liu group synthesized KMnF3 nanoparticles by heating pre-prepared manganese oleate precursor and lanthanide chlorate precursors at 290 ℃ in a mixture solution of oleylamine (1 mL), oleic acid (1 mL), and 1-octadecene (8 mL) . The prepared KMnF3 NPs can emit novel pure single-band UC emissions in the red and near-infrared spectral regions owing to an efficient energy transfer from the dopant RE3+ ions to the Mn2+ ions. (iv) More recently, Lin group heated the barium trifluoroacetate and lanthanide trifluoroacetate at 300 ℃ in a mixture solution of oleic acid (10 mL) and 1-octadecene (10 mL) and synthesized BaGdF4 nanocrystals with well-shaped (Figure 2F) . It is clear from examples that, utilizing heat-up thermal decomposition method, a wide range of high-quality UCNPs including NaYF4 [48,49], NaGdF4 [50,51], LiYF4 , NaYbF4 , Na3ScF6 , YF3 , GdOF , etc. can be synthesized. However, a judicious selection of reaction parameters is of particular importance in producing different types of fluoride nanoparticles. 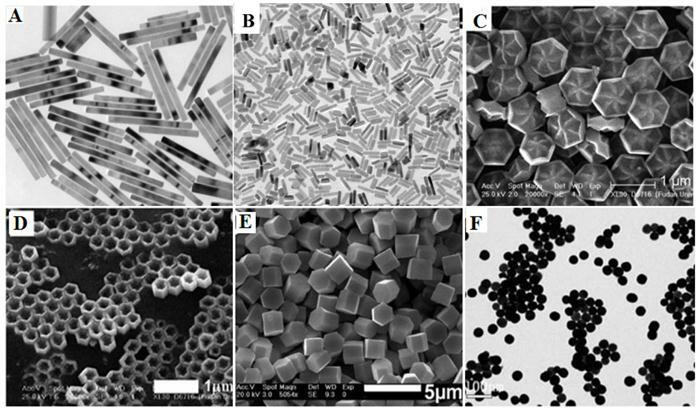 One challenge for “heating-up method” is that it is difficult to directly pare hexagonal AREF4 nanoparticles with size smaller than 100 nm; two or more steps have to be employed to realize this goal. Representative shapes of various RE fluoride nanomaterials by heating-up process in thermal decomposition reaction. Reproduced with permission from references [43-47]. (A) RE-doped cubic NaYF4 nanoparticles , (B) RE-doped hexagonal NaYF4 nanoparticles , (C) the hot-injection reaction equipment to prepare nanoparticles in (A) and (B). Reproduced with permission from the corresponding references. Stage I, α-UCNPs formation between 250 and 310 ℃. Reaction 1 is a process in which sufficient NaF reactants is produced and then interact with RE trifluoroacetate to produce nucleation of α-NaYF4 in reaction 2 . Capobianco et al. prepared monodispersed Yb/Er and Yb/Tm co-doped cubic NaYF4 NPs by drop-wise transferring sodium and lanthanide trifluoroacetates into the 310 ℃ solution (Figure 3A). It is important to note that not only Na(TFA) is decomposed at an extremely high rate, but also do RE trifluoraoacetates. Thus, reactions 1 and 2 vigorously take place, generate a burst nucleation, and finally form well-defined cubic RE-doped NaYF4 nanoparticles. The nucleation rate of Reaction 1 and 2 in “hot-injection method” is much higher than that in “heating-up” method, which also is the major difference among these two methods. In addition to this, small hexagonal NaYF4 nanoparticles can be produced using “hot-injection method”, which is not so facile in “heating-up method”. Sun group systematically investigated the growth mechanism of NaYF4 nanocrystals using “hot-injection” method . When compared with the classical heating-up approach, they found that the cubic-to-hexagonal phase transformation of NaYF4 nanocrystals is significantly accelerated in “hot-injection” method (Figure 3B); and the phase transformation process can be tuned by the injecting temperature. This is because higher reaction rates in all the reactions (1)-(4) are simultaneously realized using “hot-injection method”. Hence, small and uniform hexagonal NaYF4 nanoparticles can be produced. Hydro(solvo)thermal methods perform chemical reactions in a solvent above its critical point under an elevated pressure and temperature, which is enabled by placing RE precursors in aqueous or organic solvents in a sealed and heated autoclave [60-62]. Compared with the thermal decomposition method, hydrothermal synthesis can occur at a lower reaction temperature (general below 200 °C) and implement a set of reactions at the same time. Li's group  reported a general liquid solid and solution (LSS) approach for the synthesis of nanomaterials, whereby the reaction, phase transfer and separation take place at the interfaces. Taking the preparation of cubic NaYF4 nanocrystals (Figure 3) as an example, they primarily added linoleic acid, NaOH, ethanol and deionized water into the vessel, and then add dropwise the Y(NO3)3 and NaF solution. After stirring, three phases would be formed, i.e., sodium linoleate (solid), ethanol and linoleic acid (liquid), and the water/ethanol (solution). 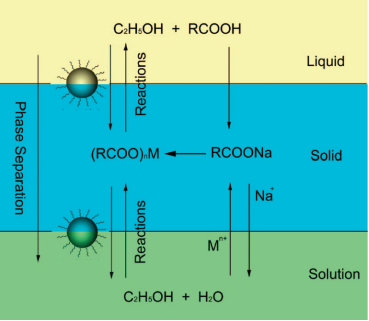 The phase transfer reaction involves ion exchange of the RE ions spontaneously across the interface of sodium linoleate (solid) and the water/ethanol solution (solution). After the phase transfer process, the RE ions will shift from the aqueous solution into the solid phase, the RE3+ ions can react with NaF to yield cubic NaYF4 nanocrystals. The LSS method has been proven to be a very powerful to fabricate rare-earth doped NaYF4 with diverse morphologies such as, microprism crystals , microrods , microtubes  octahedrons , microspheres  and flower-like NPs . It is important to note that the doping concentration also has a significant effect on the morphology and phase of final product. For instance, the high Gd-doping concentration can lead the NaYF4 particle size to become smaller, while transforming the phase from cubic to hexagonal due to the change in the surface polarization (Figure 5A) . Zhao et al. reported the uniform flower-like and tubelike NaREF4 arrays (Figure 5C, D) with multicolour UC properties via an oleic acid-assisted hydrothermal method . Li and co-workers used trisodium citrate as complex agent to synthesize diverse shaped NaYF4 nanomaterials (Figure 5E) . Recently, our group successfully developed this method to prepare BaYF5 NPs using EDTA as cheleating agent, revealing that the nucleation process of BaYF5 NPs is governed by the pH-sensitive chelating ability of EDTA with both Ba2+ and Ln3+(Figure 5F) . Though hydrothermal (solvo) method is able to produce nanoparticles of varying type, shape and size, it generally takes a long time (e.g., 24 hours) to produce uniform monodispersed nanoparticles. In addition, it requires to use strict reaction conditions to produce smaller size nanoparticles, as hydro(solvo)thermal method prefers to grow particles in bigger size. Schematic of liquid-solid-solution (LSS) phase transfer and separation synthesis. Reproduced with permission from reference . Different shapes of RE-doped fluoride nano-/microcrystals by hydro(solvo)thermal method. Reproduced with permission from references [70-73]. It is well known that biomolecules analysis is of great importance in biological detection, genetic, and molecular medicine. 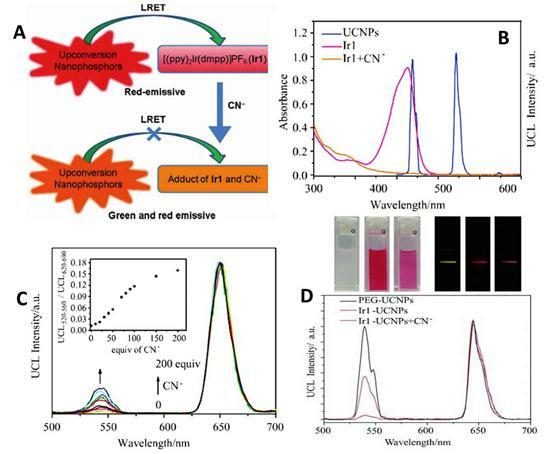 Detection of biomolecules via UCNPs as luminescent reporters in a variety of in vitro assays appears to be one of the most attractive approaches, as it works at virtually zero background and thus improved the limits of detection (LOD) when compared with conventional reporters (e.g., dyes, quantum dots). In the early age of sensing applications, Hampl et al. utilized sub-micronsized Y2O2S:Yb/Er particles as UC luminescent transducer . Despite of the large size, they still show a low LOD of 10 pg human chorionic gonadotropin in a lateral flow (LF) immunochromatographic assay, which is about ~10-fold increase over the use of conventional labeling agents of colloidal gold or colored latex beads. Similarly, Tanke et al. used 400-nm Y2O2S:Yb/Er particles to obtain a low LOD of 1 ng/µl oligonucleotides . It was found that the sensitivity is 4 times stronger than the one using the conventional reporter of cyanine 5 labels. Recently, utilizing small but efficient upconversion nanoparticles, biomolecules sensors based on upconversion FRET technique have also been proven to exhibit a high sensitivity in a range of biological and chemical analyses . A FRET system comprise of fluorescence donor and acceptor, which are conjugated to different biomolecular entities. The fluorescence of the donor can be effectively quenched (absorbed) by the acceptor when the distance of the donor and the acceptor comes into nanometer scale. As the distance of the donor and the acceptor is determined by their concentrations, the fluorescence intensity is linearly related to the concentration of the target when fixing either a donor or an acceptor concentration. Importantly, the FRET-UCNPs system was proved to have quite low LOD in a range of experiments [77-52]. Wang et al. firstly exploited the FRET system using UCNPs as energy donors and gold NPs as energy acceptors to detect goat antihuman immunoglobulin (IgG), reaching a low LOD of 0.88 mg/mL. Moreover, Soukka group has shown that UCNPs are useful in energy transfer-based sandwich immune assays [78,79]. Subsequently, Wolfbeis's group developed the FRET system employing the acceptor of biotinylated Au-NPs and the donor of the avidin-modified NaYF4:Yb/Er NPs in order to detect trace amounts of avidin . The scheme of the FRET system in their work is shown in Figure 6A. When Au-biotin NPs were added into the solution of avidin-conjugated UCNPs, it will bond to the surface of the UCNPs due to the sensitive and selective interaction between avidin and biotin. Since the strong absorption at ~ 541 nm of Au NPs well matches the UC emission of NaYF4: Yb3+, Er3+ NPs, the green emission in UC nanoparticles will be quenched due to the FRET process. A resulted linear quenching of green UC emissions allows us to detect trace amounts of avidin proteins. Li group used a similar approach to detect avidin on the basis of the selective binding of avidin and biotin , displaying the ability to detect an amount of avidin in “nM”. (A) Schematic representation of the binding of biotinylated gold nanoparticles to avidinylated UCNPs. Photographs: (a) colorless suspension of UCNP under visible light; (b) UCNPs with green luminescence under 980-nm laser excitation; (c) adding red Au-NPs under visible light. (B) Luminescence of the UCNPs (photo-excited at 980 nm) after addition of varying concentrations of biotinylated gold NPs. Adapted from reference . (A) Schematic illustration of the upconversion FRET process between ssDNA-UCNPs and GO for ATP sensing; (B) PL spectra of the UCNPs-GO FRET aptasensor of varying concentrations of ATP. Adapted from reference . Instead of using gold as an acceptor, Liu et al. proposed a novel FRET sensor platform utilizing graphene oxide as an acceptor . In this system, Yb/Er-codoped NaYF4 UCNPs were conjugated to ssDNA; their whole visible upconversion emissions were totally quenched by graphene oxide (GO) due to their ultrahighly strong absorption, as shown in Figure 7. When adding the adenosine triphosphate (ATP), their luminescence can be recovered by gradual dissolution of them from GO. Luminescence increase of single-stranded DNA-functionalized UCNPs (ssDNA-UCNPs) was found to be linearly dependent on the concentration of ATP (Figure 7A). It is striking that this result not only was performed in a wide detection range from 0.5 µM to 2 mM (Figure 7B), but also extends the application of UCNPs biosensors to the DNA biomolecules . In addition, UCNPs-based sensing technique can also be used for the detection of oligonucleotides , as displayed in Figure 8. The longer target nucleotide can be formed by two short oligonucleotides, which respectively attached to a UCNP and a fluorophore. 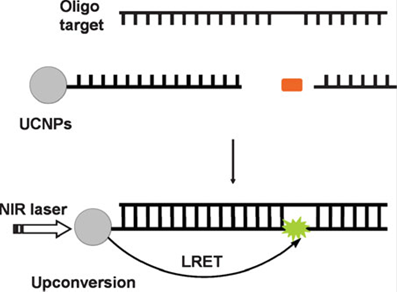 When the targeted oligonucleotides are produced, the efficient luminescent resonance energy transfer (LRET) process from the UCNP to the fluorofore takes place, evoking fluoresence from the fluorophore. An aptasensor based on magnetic NPs coupled with UCNPs for specific detection of bacteria of S. Typhimurium and S. aureus was also explored by Duan et al. . This design allows one to capture and concentrate bacteria with the help of a magnetic field, and monitor the process by the amplified luminescent signal due to accumulation. Besides gold, GO, and magnetic NPs, Shao's group also explore FRET biosensing system based on the silver NPs and the UCNPs for DNA detection . These recent sensing works suggests that UCNPs (often used RE-doped NaYF4 nanomaterials) with proper biomolecules-targeting can apply to different biomolecules detection. The schematic of a oligonucleotide sensor design. Reproduced with permission from reference . In this section, we summarized recent works on the use of UCNPs for detecting various chemical ions, which delivers real-time information on targeted ions in complex samples. Hazardous ions such as cyanide ions (CN-) and mercuric ions (Hg2+) are extremely toxic to mammals ; detecting and evaluation of the concentration of these, therefore, are of particular interests and importance for the lives. Sensing ions using UC lanthanide-doped UCNPs has been shown to be highly sensitive in living cells due to efficient LRET . As the UC effect is inert to the interested ions , UCNPs have to be used in combination with suitable indicator that has a recognition capability of the targeted ions. The biochemical recognition will then modulate the fluorescence intensity of UCNPs and make the luminescent intensity dependent on the targeted ion concentration. In such way, the UCNPs can perform an accurate detection of the targeted ions; the displayed colorimetric changes in solution even can be discerned by the naked eye . Li et al. 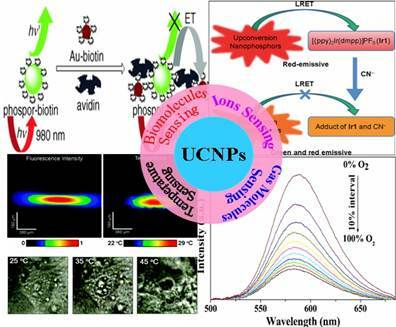 reported on a highly selective and sensitive CN− sensor by using a chromophoric iridium (III) complex-coated UCNP. This sensing system relies on the strong quenching of the green UC emission by chromophoric iridium (III) complex due to the LRET mechanism . When adding CN−, the quenching effect dramatically decreases and causes LRET to be ineffective. Hence, the green UC emission of NPs can be recovered (Figure 9A). The emission spectrum of the UCNPs and the absorption spectrum of Ir1 are shown in Figure 9B. The UC emission peaks at 540 nm and 650 nm. The Ir1 dye has a strong absorbance with a maximum peak at 530 nm, which does not influence the red emission band of UCNPs. When CN− complex is absent in the system, chromophoric iridium (III) complex exerts a significant quenching effect on green band of the UCNPs. As the absorption of chromophoric iridium (III) complex at ~500 nm is quite sensitive to the CN− ions, this feature creates a possibility to use ratiometric evaluation CN− concentration using the green UC at 540 nm and red UC at 650 nm (its intensity is not affected by CN− ions). The UC luminescence spectra at different concentration of CN− values are shown in Figure 9C. The ratiometric change of intensity between green emissions at 540 nm and red at 650 nm clearly has a linear dependence on the CN− concentration. It is important to note that the developed CN− sensor was implemented in pure water, having an important implication for use in live cells . In another work by Li's group, chromorphoric ruthenium complex-assembled UCNPs were prepared to detect Hg2+ ions . They employed NaYF4:20 mol%Yb, 1.6 mol%Er, 0.4 mol%Tm UCNPs which are coated with the ruthenium complex that is sensitive to Hg2+ ions. They use the ratio (UCL541/UCL801) as the output signal to detect the Hg2+ in aqueous solution, as the intensity of the 801 nm emission is immune to the Hg2+ ions. The experimental result is shown in the inset of Figure 10. The LOD of Hg2+ ions for this sensor in water was down to 1.95 ppb (parts per billion); this value is even lower than the maximum level (2 ppb) of Hg2+ in drinking water set by the United States Environmental Protection Agency. (A) Schematic illustration of the LRET process between UCNPs and the iridium(III) complex ([(ppy)2Ir(dmpp)]PF6, Ir1). 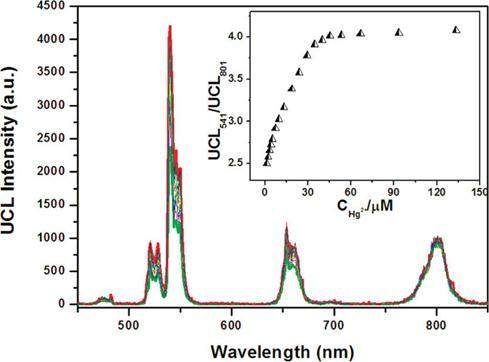 (B) UV-vis absorption spectra of Ir1 and Ir1 upon addition of CN−, and photoluminescence spectrum of UCNPs. (C) Emission intensity changes of the Ir1-UCNPs complex with an increasing amount of cyanide in water. Inset illustrates the change of the intensity ratio (the emission band at 520 nm to the 650 nm emission band) as a function of the CN− concentration. (D) Photographs of water solutions of PEG-UCNPs, Ir1-UCNPs and Ir1-UCNPs after doped in 500 equiv. of CN− (top left); corresponding photographs of emission (top right) and photoluminescence spectra (bottom) with an excitation at ~ 980 nm. Reproduced with permission from reference . Upconversion luminescence spectra of 0.3 mg mL-1 N719-UCNPs (27.6 μM N719) in the aqueous solution upon a gradual addition of Hg2+ ions (from 0 to 135 μM). Inset: the ratio UCL541/UCL801 of upconversion luminescence intensities at 541 and 801 nm of N719-UCNPs as a function of Hg2+ concentration. Reproduced with permission from reference . Differing from Li's work, Zhang et al. proposed a new scheme for detecting Hg2+ in aqueous media through the use of a single-stranded DNA as Hg2+-capturing element . A NaYF4:Yb/Tm UC NP is employed as an energy donor, while the SYBR dye functions as an energy acceptor. As shown in Figure 11A, the SYBR has a strong absorbance overlapping with the visible blue emission of the UCNPs around 477 nm. After the addition of Hg2+ ion, the luminescence spectra of the mixture are shown in Figure 11B. This result indicated the energy transfer between the UCNPs and SYBR causes simultaneous decrease of the 477 nm emission of the UCNPs and the increase of signals corresponding to SYBR green emission. 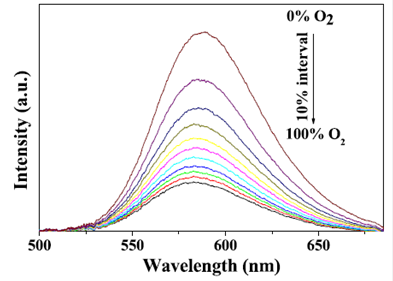 Utilizing the ratio of the acceptor emission to the donor emission, mercuric ions can be quantified with a high sensitivity at a LOD of 0.06 nM. Yan's group developed a novel approach for the detection of Ce4+ by MPTEA-functionalized UCNPs derived from azelaic aldehyde-capped precursors . And the Ce4+ sensor was constructed based on the dual-emission arising from different spectral responses of MPTEA and the UCNPs. To sum up, these UCNPs functionalized with other groups have great potential for applications in ions sensing. Determination of gas molecules such as oxygen, carbon dioxide, ammonia, and many others in aqueous samples or biological fluids has great significance in analytical biochemistry, clinical medical diagnosis and bioprocess monitoring [92,93]. The use of UCNPs for gas molecules sensing has attracted extensive interest because of their outstanding properties [28, 94]. The first sensor based on UCNPs of oxygen was presented by Wolfbeis group , in which UCNPs as nanolamps and iridium(III) complexes as quenchers were both embedded in a thin film of ethyl cellulose. The emission of the UCNPs overlaps with the absorbance of the iridium(III) complex (Figure 12A). Thus, the green-yellow luminescence of iridium complex can be induced by the blue emission of NaYF4:Yb,Tm UCNPs when excited at ~980 nm. Since the fluorescence of iridium(III) complex is sensitive to molecular oxygen, its intensity is sensitive the content of environmental oxygen (Figure 12B). Liu et al. designed a novel multifunctional nanocomposite sensor, which possesses upconversion, oxygen-sensing and bio-affinity properties. The UCNPs of the type NaYF4:Yb,Tm coated with Ru(II) complex chemically doped silica form the sensor to obtain the response to oxygen. When the multifunctional sensor was exposed to O2, the emission intensity of the Ru(II) complex decreased. Furthermore, the novel oxygen sensor carried out the precise detection from 0 to 100% O2, indicating its high sensitivity (Figure 13). (A) Photoluminescence spectrum of the NaYF4:Yb3+,Tm3+ nanoparticles, excited by a 980 nm diode laser, and the excitation and emission spectra of SYBR Green I are included for comparison. (B) Photoluminescence spectra of the photon UCNPs before (dark) and after (red) the addition of 2.6 nM of Hg ions, in the presence of SYBR Green I (~2 uM) and PDCA (∼6.8 mM). Reproduced with permission from reference . 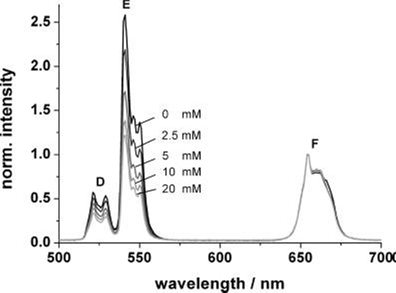 (A) Emission spectra of the NaYF4:Yb,Tm nanoparticles (i), the absorption of the oxygen probe [Ir(CS)2(acac)] (ii), emission spectrum of [Ir(CS)2(acac)] (iii); (B) Visible emission spectra of an ethyl cellulose sensor film containing the NaYF4:Yb,Tm UCNPs and the oxygen probe [Ir(CS)2(acac)]; (C1) in argon and (C2) argon containing 20% oxygen. Reproduced with permission from reference . Room temperature emission spectra of Ru(II) complex functionalized NaYF4:Yb3+,Tm3+ @SiO2 under different oxygen concentrations. Reproduced with permission from reference . Sun et al. presented the first optical pH sensor based on UC luminescence of NaYF4:Yb/Er nanorods and pH dependent absorption spectrum of BTB (bromothymol blue), which can be extended to sense acidic gases such as (dissolved) carbon dioxide or (dissolved) ammonia . Subsequently, the carbon dioxide and ammonia optical sensors have been developed based on the colorimetric or fluorometric changes due to the resulted variation of pH value in solution induced by these gas molecules [97, 98]. Usually, optical sensors for CO2 and NH3 are based on their reactions with hydroxy ions of an alkaline buffer. The change in the pH value leads to the change in color or fluorescence of the indicator. Thus, CO2 and NH3 sensing experiment can be carried out by detecting the variation of luminescence intensity of UCNPs. Wolfbeis group has developed a novel CO2 optical sensors, which coupled NaYF4:Yb,Er UCNPs with BTB in a matrix of polystyrene . The polystyrene as matrix displays high permeation to CO2 but rejection to protons. As CO2 penetrated the polymer and reacted with hydrated BTB ion pair, the pH inside the film decreased, leading the emission of the UCNPs to increase. As shown in Figure 14, the detection of CO2 can range from 0 to 3%. The response time is evaluated to be about 10 s for switching from pure argon gas to 1% CO2 in argon, and the LOD is measured to be about 0.11% for the content of CO2. 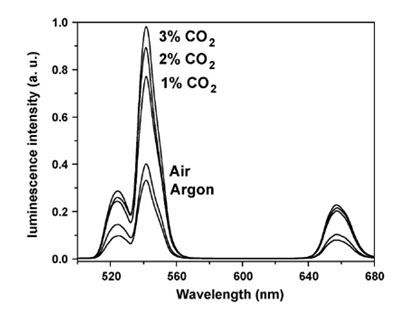 Upconversion emission spectra of the polystyrene sensor film containing the UCNPs in presence of 1, 2 and 3% of CO2, air (0.003% CO2) and argon. Reproduced with permission from reference . According to a similar principle, Mader et al. has designed an ammonia sensor based on the combination of NaYF4:Yb,Er nanoparticles and a pH probe of the phenol red which are both immobilized in a polystyrene matrix. Once the NH3 penetrated the sensor film, it produced a strong absorption at 560 nm in the pH probe; the green emission of the UCNPs will then be screened off. Since the emission band at 660 nm is not affected by the indicator dye, its intensity can serve as a reference standard. The ratio of the intensities of the green and the red UC emission, therefore, can be used to determine the content of ammonia. Figure 15 displays the decrease of the intensity of the green emission band along an increase in the ammonia concentration from 0 to 20 mM; the LOD of this system was evaluated to be as low as 400 μM. Upconversion luminescence spectra of the ammonia sensor film at dissolved ammonia concentrations between 0 and 20 mM. Excitation wavelength 980 nm; spectra are normalized to the peak at 655 nm. Reproduced with permission from reference . where Kb is the Boltzman constant, △E is the energy gap between the two excited levels and A is a constant. Equation (5) illustrates that the logarithmic ratio of I520/I550 has a linear dependence on the inverse of temperature. It is also important to note that Er3+ ions can have good upconversion emissions at 530 and 550 nm when excited at wavelength of 980 nm that falls within the “optical transmission window of tissue”. This feature provides an opportunity for non-invasive and sensitive measurement of temperature in biological processes, even for that located at deep tissues . In addition, the ratiometric data of I520/I550 are independent of variations in the intensity of the laser exciation source and drifts in the photodetector, making them ideally suited for temperature sensing. While optical temperature sensors utilizing the intensity ratio of I520/I550 in Er3+ ions have been extensively investigated [103-106], most studies were based RE doped oxide bulk materials that are incompatible with biology. A use of optical temperature sensors in biology requires colloidal small-sized RE-doped nanoparticles with highly efficient upconversion nanoparticles. Fluoride materials have been proved to be more efficient than oxide materials due to their low phonon cut-off energy [107-110]. Yb3+ ion has a very large absorption cross-section at ~ 976 nm, which also can efficiently sensitize the neighboring Er3+ ions and dramatically increase the upconversion emissions. Yb/Er-codoped colloidal fluoride nanoparticles, therefore, become a promising nanothermometer for use in biology. The temperature dependence of Yb/Er codoped NaYF4 powders were investigated independently by Suyver et al. and Wu et al. , drawing the same conclusion as described in equation (5). Although Tm3+/Yb3+ codoped Y2O3 UCNPs were investigated as thermometers to detect a temperature range from 303 K to 753 K , the sensitivity of temperature (a fractional rate of change in the fluorescence intensity ratio with the temperature) is lower than Er3+/Yb3+-doped fluoride nanoparticles. The first real UC nanothermometer in live cell was demonstrated by Capobianco et al. using water-dispersed polyethyleneimine-coated NaYF4:Er3+/Yb3+ UCNPs (Figure 16C) . To demonstrate their ability to record thermal gradient images of liquids, nanothermometers were first used to obtain thermal profiles in a water solution of NaYF4:Er3+/Yb3+ nanoparticles using a pump-probe experiment (Figure 16 A and B ). When excited at 980 nm (pump beam) the total emission fluorescence intensity of these nanoparticles was used to reveal the pump shape profile (see Figure 16B, left panel). Simultaneously, the small-sized focus point of 488 nm (Ar+) laser (probe beam) was scanning over the pump beam profile to accurately determine the fluorescence intensity ratio of I525/I545, and thus the temperature of each point on the pump profile (see Figure 16B, right panel). In another experiment, following incubation of the NaYF4:Er3+/Yb3+ nanoparticles with HeLa cervical cancer cells and their subsequent uptake, the fluorescent nanothermometers were used to measure the internal temperature of the living cell from 25 °C to its thermally induced death at 45 °C, as shown in Figure 16C. It is important to note that the excitation wavelength in Figure 16C is ~920 nm; this wavelength is not absorbed by water and creates negligible thermal effects. Experiments in Figures 16 conclusively demonstrate that the NaYF4:Er3+/Yb3+ nanoparticles are good nanothermometers for biology. We would like to point out that Wolfbeis et al. have investigated temperature sensing using UCNPs of varying size and RE dopants recently . They found that the core-shell structured hexagonal (NaYF4:Yb20%Er2%)/NaYF4 UCNPs, due to their higher brightness, are more suitable for temperature sensing, as they have the ability to resolve temperature differences of less than 0.5 °C in the physiological range between 20 and 45 °C . Nanoparticle-based thermometer offers many options for imaging the two-dimensional distribution of temperature, and plays a vital role for understanding the sub-cellular processes. Applications of UCNPs in a range of other nanophotonic and biophotonic topics can be found in a recent review . This review summarizes recent progresses on the chemical synthesis and sensing applications of UCNPs. Novel sensing strategies are always based on the development of materials science with new and novel properties. The unique frequency converting properties in monodisperse UCNPs indeed provided numerous opportunities for a wide range of theranostic applications, such as detection of biomolecules (e.g., avidin, ATP, etc. ), ions (cyanide, mecury, etc. ), small gas molecules (oxygen, carbon dioxide, ammonia, etc. ), as well as in vitro temperature sensing. However, challenges are still remained, for example, the aqueous phase UCNPs with high efficiency are required for biological sensors. Although surface engineering can impart water solubility and biocompatibility to them, the luminescence efficiency after surface modification generally decreases a lot. In addition, a practical sensing application requires UCNPs to be highly efficient, while the biology requires UCNPs to be as small as possible to reduce any exposed potential toxicity to the body. However, small size generally results in very low luminescence efficiency, especially for the size below 10 nm. Ways to increase the upconversion efficiency as well as applications of UCNPs in piratical medical problems need to be explored, which are expected to result in better sensing sensitivity and ultimately provide ways for point of care of diagnosis of diseases. (A) Schematic of nanothermometer used to monitor the temperature profile created by heating a colloidal solution of NaYF4:Er3+,Yb3+ UCNPs in water with a NIR diode laser (980 nm, pump beam) and scanned with a Ar+ laser (488 nm, probe beam). (B) Confocal image of all the visible upconverted luminescence under 980 nm excitation (Left). Thermal image of the spot created by the 980 nm pump beam (Right). (C) Optical transmission images of an individual HeLa cell at different temperatures and temperature-dependent property of the HeLa cell determined by UCNPs as a function of the applied voltage . The voltage determines the heating temperature of plate under the cells. Reproduced with permission from reference . This work is supported by Natural Science Foundation of China (51102066).